Cylinders – Metro Hydraulic Jack Co.
A global market leader, Enerpac hydraulic tools are trusted to handle the heaviest loads safely and precisely. Doing business since 1910, Enerpac products provide long-lasting value and dependability. Access their quality products, like RC-Series Single Acting Cylinders, CLSG-Series High Tonnage Cylinders and more, through our extensive online catalog. SPX Power Team maintains quality in all stages of product, from design to manufacturing to service. Their commitment to innovation ensures the cylinders meet even the most demanding needs. Industries like automotive, industrial, mining, and construction turn to Power Team products for their durability. We make finding SPX products easy–find everything from cylinders and jacks to pumps and valves in our catalog. Get more than 100 years of experience behind every Simplex product. 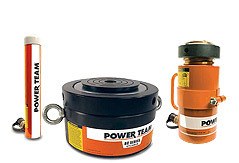 These cylinders offer customers confidence in their high pressure, hydraulic applications. 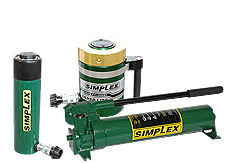 At Metro Hydraulic Jack Co., we offer an expansive selection of Simplex tools. Check out our online inventory, or contact one of our sales representatives today! Metro Hydraulic has offered quality products and services since 1941. Our extensive product catalog includes single and double acting hydraulic cylinders, as well as lock nut and high-tonnage cylinders. The hydraulic cylinders we offer are most often used in construction equipment, manufacturing settings, and other heavy-duty applications where extremely heavy loads must be lifted or pushed. The main construction of a hydraulic cylinder includes a barrel, piston with sliding rings and seals, and a piston rod. Differences in construction are present in single acting, double acting, single rod and double rod variations. Single acting cylinders function with one side of the piston being acted on by hydraulic or other pressurized fluid, while the fluid alternates action on both sides of the piston in a double acting cylinder. If the cylinder is double acting with a double rod design, the piston’s head is equally covered by a rod on each side with no force difference. This requires less operator force to produce a push or a lift than a cylinder with a double acting, single rod design. 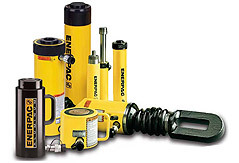 At Metro Hydraulic, we only carry the highest quality products from the most trusted hydraulic cylinder manufacturers, including Enerpac, SPX and SIMPLEX. Our company is a leading provider of hydraulic parts and services, and our inventory is ever-growing. If you have any questions or would like additional information regarding any of our offerings, please do not hesitate to contact us!